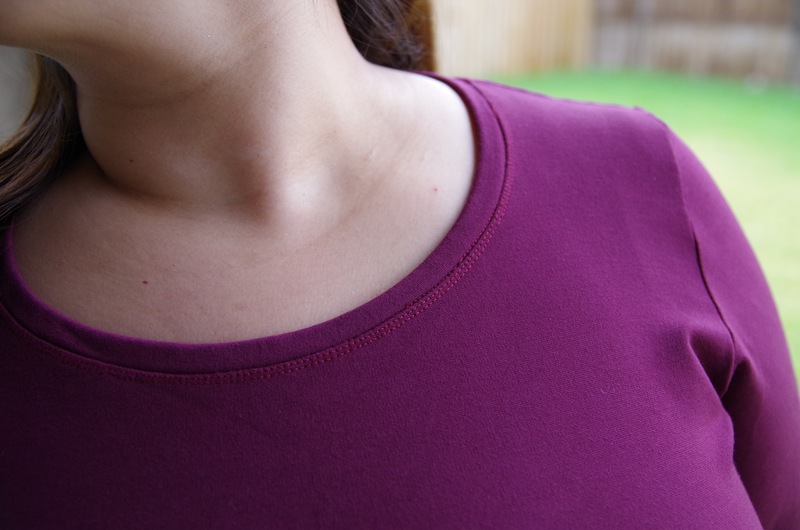 What do you know…another Gertie Sweetheart Knit top. What can I say? This is a great pattern! When I started losing weight, I figured I could size down already…that wasn’t the case. I actually made this top about two months ago but it wasn’t wearable. I only did an FBA at the time so the Swayback is apparent, and it’s still too small for my comfort. This is a ponte knit remnant from Hancock Fabrics (of course) and cost $4. It retails for much more so this was a steal. I raised the neckline about three inches and it initially looked strange because I didn’t use a french curve ruler. It ended up looking like a deep “U” shape. Obviously I found the ruler and all is well in my sewing world. This is the BEST neckline I’ve ever done! So proud of how it turned out <3. That really is a killer neckline. You nailed it! And wow, you look great in these pics.